Will Ireland Apologize to the Women of the Magdalene Laundries? 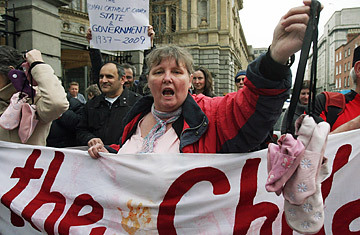 Mary Smith from Co. Cork who was abused in a Magdalene Laundry holds up children's shoes as she joins clerical abuse survivors from Canada before they meet Taoiseach Brian Cowen at Government Buildings in Dublin, Thursday April 15, 2010. The 1955 advert for the Magdalene laundry in Dublin, Ireland reads like a tear-jerking charity appeal: "The Superioress and Sisters of The Magdalen Asylum ... very earnestly beg the support of the liberal and kind-hearted to help them with the upkeep of the Institution for 130 Poor Penitents, who receive a home within its walls." But the reality for many of the "penitents"  or repentant sinners  living in these institutions was very different from the ad's beneficent tone. The ten Magdalene laundries, which operated from before the foundation of the Irish Free State in 1922 until 1996, were for-profit businesses where women and girls were incarcerated against their will and forced to do unpaid physical labor. Over the past few years, a number of former Magdalenes have come forward with accounts of the physical and psychological abuse they suffered at the hands of the nuns who were supposed to be caring for them. The survivors of the laundries  due to a lack of records, nobody knows exactly how many there are  have long been seeking official recognition of their ordeals, asking for an apology from the government and compensation for their years of unpaid work. Now, with a recent United Nations decision in their favor and an announcement by the Irish government that it will establish an inquiry to clarify the State's relationship with the institutions, many in Ireland feel that the Magdalenes may finally find justice. They may have been labeled sinners, but most of the Magdalene victims committed no crime other than to have broken the social mores of the strict Catholic society in which they lived. Some had give birth outside marriage; others were themselves illegitimate. Some girls were sent to the laundries because someone in authority considered them to have acted promiscuously, and some because their families were incapable of taking care of them. Margaret (not her real name) was brought to the Good Shepherd Magdalene laundry in Cork at the age of 17 having been badly mistreated by her mother. For six years she worked six days a week  Monday through Friday in the laundry and every Saturday cleaning the church. "We were robbed of our freedom," she says. "We all got a number from one to 100. I was 45  everything belonging to [you], your number was put on it. When the washes were put through they would say, 'Oh, that was number 45.' It was never "that's Jennifer's or that's Marian's"  you were always just a number." When Margaret, now 64, left the laundry and was put to work in a hospital, she was shocked that she actually "got paid for it and got two days off in the week." Yet she considers herself "one of the lucky ones." She wasn't physically abused during her time as a Magdalene and built a good life for herself after she got out. Now happily married with a grown daughter, Margaret knows of many women who did not fare as well. Testimonies collected by the advocacy group Justice for Magdalenes (JFM) give a disturbing insight into how much the women living and working in the laundries suffered: "When [you] got there, they took all your clothes off, cut off your hair and bandaged [your breasts] up so that you wouldn't look like a girl, because your body was a sin and belonged to the devil," one account reveals. "You were hit or ... punished by your hair getting cut shorter and shorter," another former Magdalene recalled. "For talking out of turn, for being in the wrong place at the wrong time, for being late coming down from the dormitory ... We never asked about pay. We didn't know we were supposed to be paid to work...We had no rights whatsoever." Yet another testimony speaks to how their time in the laundries haunted some women for the rest of their lives: "I [have] tried to commit suicide many times in the past. I never found happiness. I felt like broken pieces." For years advocacy groups have been demanding that Ireland's leaders acknowledge the State's responsibility and apologize for what happened in the laundries. But even though government agencies were among the customers of the Magdalene laundries, previous Irish governments have denied culpability, distancing themselves from the issue by noting that the State did not run the institutions. That excuse may not work for much longer, however. Following a submission by advocacy group JFM, the United Nations Committee Against Torture (UNCAT) released a report on June 6 that held that the government should set up a statutory investigation into the laundries, provide redress for those who suffered in them, and punish the perpetrators of any abuse. In its report, UNCAT says it is "gravely concerned at the failure by the State party to protect girls and women who were involuntarily confined ... by failing to regulate their operations and inspect them." Responding to UNCAT's statement, Irish Prime Minister Enda Kenny said: "Taking into account the difficulties experienced by the women for a variety of circumstances, we at least owe it to them, after more than 100 years, to look at the implications of this report." A week later, the new Fine Gael/Labour government announced it has ordered that a committee be set up to carry out a limited inquiry  the sole purpose of which is to clarify the State's interaction with the laundries  and put in place a "restorative and reconciliation process" where appropriate. On Friday, senator Martin McAleese, husband of Irish President Mary McAleese and a respected figure in the Northern Ireland peace process, was appointed to head the committee. Separately, members of the Ministry for Justice are due to meet with the four religious congregations who ran the laundries and advocacy groups to discuss the cases of the former Magdalenes and the women who are still in the care of the religious orders. JFM has welcomed the developments the news but cautions that the government needs to act quickly given the age of many of the Magdalene survivors: "The women need help now," says James Smith, a Boston College English professor who sits on JFM's advisory committee. "They have suffered in silence too long, and many of them feel that the government has pursued a 'deny 'til they die' policy." JFM wants the government to issue an apology, pay the survivors compensation and recalculate their pensions to include any time spent working in the laundries  and quickly, while the women "are still alive to enjoy these deserved entitlements," says Smith. For now, however, the victims of the Magdalene laundries can only wait and hope that their country will finally repent for turning a blind eye to the injustices they suffered.